Researchers in the Cockrell School of Engineering at The University of Texas at Austin will work with the U.S. Army Research Labs (ARL) and Uber Elevate to help develop new rotor technology for vehicles that will be used in Uber’s proposed urban aviation ride-share­­ network — called uberAIR. Last year, Uber announced that the first Uber Elevate cities would be Dallas (DFW metroplex) and Los Angeles, with a goal of flight demonstrations in 2020 and plans to make uberAIR commercially available to riders in those cities by 2023. As part of the uberAIR program, the company has entered into partnerships with several major aircraft manufacturers and signed a space act agreement with NASA, which will stimulate the development of new unmanned traffic management concepts and aerial safety systems. The design of the vertical take-off and landing (VTOL) aircraft to be used in the project specifies that it is a fully electric vehicle with a cruising speed of 150-200 mph, a cruising altitude of 1,000-2,000 feet and the ability to complete trips of up to 60 miles on a single charge. Sirohi is one of the country’s leading experts in unmanned aerial vehicle (UAV) technology, VTOL aircraft and fixed- and rotary-wing aeroelasticity. He and his team, which includes postdoctoral fellow Christopher Cameron and Charles Tinney from UT’s Applied Research Laboratories, will explore the efficiency and noise signature of stacked co-rotating rotors, or propellers, for VTOL, a novel flying technology in which two rotor systems are stacked on top of each other and rotating in the same direction. Preliminary testing of this concept has shown the potential for stacked co-rotating rotors to be more efficient than other approaches while simultaneously improving versatility and overall performance for a flying craft. Both of the proposed Uber Elevate launch cities suffer from major traffic congestion, especially during rush hour. For example, the current drive from DFW International Airport to the nearby city of Frisco, a distance of less than 25 miles, could take up to an hour during rush hour. 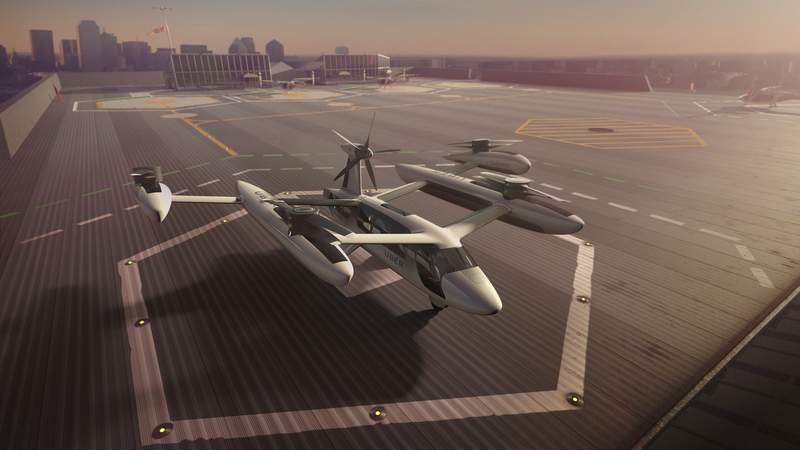 In an uberAIR vehicle, it could take less than 10 minutes. An official launch of the collaboration takes place today on campus with leaders from Uber, ARL and UT in attendance. For more information, contact: Johnny Holden, Cockrell School of Engineering, 512-471-2129.